Note: This is Lesson 4 of our Free Email Feeds & Speeds Master Class. Click here to learn more about the Master Class. Well, if you’re not afraid of tool deflection, you should be. But how much is too much deflection, and how should we think about it? It can instigate chatter. If deflection is low enough, chatter is much less likely. It can reduce tool life. Deflecting a tool is bending the tool, and we all know what happens when we bend a paperclip too many times! It can ruin surface finish. Depending on the conditions, the tool may deflect into the wall of the cut leaving a chatter-like ripple. It messes with tolerances. Your CAM software assumes a perfect cylinder, not a deflected bent up one that is thrashing around in the cut. OK, then what are the limits of Tool Deflection? Why? And is G-Wizard Calculator optimistic or conservative about those limits? I recently finished several fairly in-depth discussions with folks running expensive production machining jobs about the limits of Tool Deflection and how to think about them. 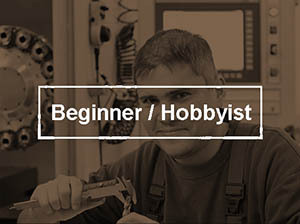 First, Tool Deflection is extremely important to Tool Life, Chatter, Surface Finish, and the Tolerances on your jobs. If your Feeds and Speeds ritual does not involve checking the Tool Deflection, you’re leaving money on the table and likely dealing with problems you’d rather not deal with. Let’s dig in and understand the topic more deeply. 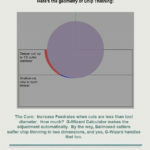 Let’s start with how G-Wizard determines deflection limits. 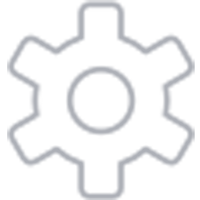 They’re very conservative and are based on recommendations from major tool manufacturers like Ingersoll designed to limit the onset of chatter. These are in fact the most conservative limitations on deflection. And it’s important to avoid chatter because it will tear up your tools faster than almost anything. For roughing, a limit of 0.001″ is set for a typical solid endmill of 1/2″ or so, and this is scaled based on cutter diameter when you start talking really small endmills or really big ones. Since this is the most conservative limit on deflection, we can be assured that Tool Life, Surface Finish, and Tolerances are likely taken care of too with this limit. 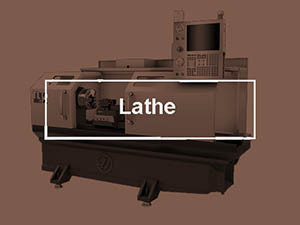 If you wonder about chatter and deflection, pop over and watch the great Haas video where they vary spindle speed to control chatter on a lathe. The reason they have the chatter is they’re hanging bars out too far without a tail stock and they’re deflecting. 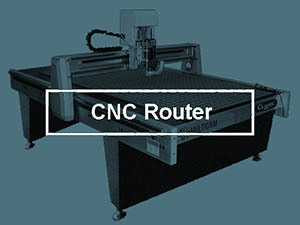 This time it’s the workpiece and not the tool, but the principle is the same. When finishing, we will want a tighter limit, primarily for surface finish and tolerances. We rely on the finish pass to clean up tolerance issues that may have developed due to deflection, and in fact, tolerance is the most generous allowance for deflection, so we can mostly ignore it given a finish pass for clean up. After all, if we’re going to shave 15 thou for the finish pass, we can tolerate up to 15 thou in the roughing pass. Our deflection should be much less than that under any circumstances. G-Wizard will automatically tighten the limit in Cut Optimizer for Finishing. What if There’s No Chatter? Can you exceed G-Wizard’s chatter-based Deflection warnings? Absolutely–chatter may not have been a risk for the combination of parameters you were using for the cut. But you need to think about what your strategy for chatter is going to be. For many, avoiding even the possibility of chatter is better than dealing with it in the heat of a job. If that’s the case, respect the limits G-Wizard sets. Limit Chatter: Chooses a very conservative deflection limit that helps avoid chatter. This is the default. Best Finish: Chooses a much lower limit if you are in the Finish (non-Roughing) portion of the Tortoise-Hare slider. This helps reduce tooling marks in the wall of the cut for better surface finish. This is OFF by default. 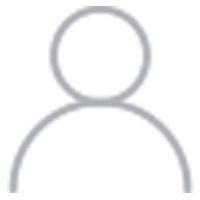 Deflection Limit: If you turn off “Limit Chatter”, this area is enabled. It lets you set a Deflection Limit that is a percentage of maximum chipload. It also tells you the impact on Tool Life. For example, at 20% of max chipload, Tool Life is 92% of normal. If you’re in a tough situation and need a higher deflection limit, turn of Limit Chatter and dial up the Deflection Limit until you hit a Tool Life value that is as low as you can stand. That’s a manageable number of variables, and if you know the chatter danger zone in terms of spindle rpm for those variables most of the time, you’ll know whether chatter is even an issue for the Feeds and Speeds you’re contemplating. The chart measures Runout (or Deflection as we’re talking about here) as a % of chip load, which makes sense. Bigger cutters allow more chip load and more runout. Let’s say we’re running a 3/4″ endmill for a roughing operation. 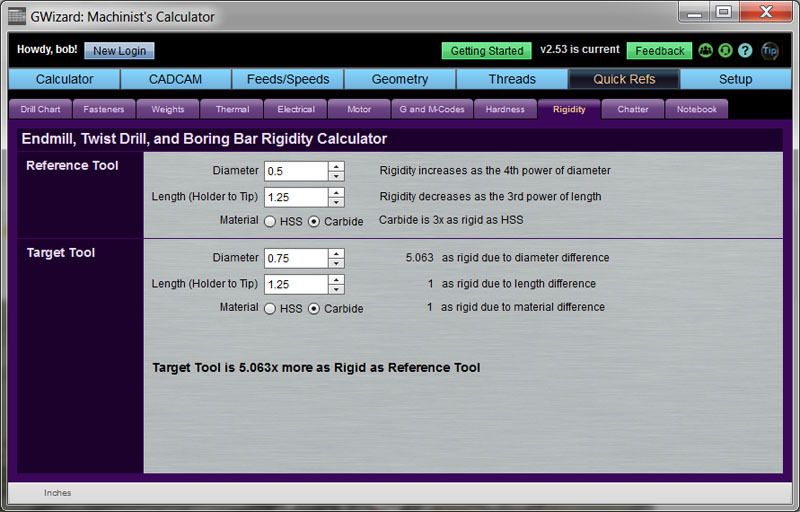 G-Wizard’s default on a TiAlN Carbide Endmill suggests a max of 0.0036″ chip load. You can buy endmills that allow more, but let’s run with this. If we take G-Wizard’s 0.001″ deflection limit, that’s about 28%. We can see from the chart we’re still going to get 90% of our Tool Life or so. Deflection is probably not the big factor. But, what if we run 0.003″ of Deflection–3 times G-Wizard’s recommended limit. Now we’re at 83% of chip load and the chart suggests we’re probably going to break that tool in short order. I look at that chart and about 80% Tool Life, which corresponds to 35% of chip load for the Deflection, seems like what I’d be willing to put up with to get a little more aggressive cuts. That tells me I might set G-Wizard’s Deflection Limit (on Setup Other) up to maybe 120-125% if I wanted to live life on the aggressive side. As it turns out, G-Wizard’s default is pretty reasonable for most users. Sometimes, there will be other considerations for Tool Deflection. I was visiting a shop one day that had just gotten Volumill in for HSM toolpaths. They wanted to try it out and fired off a job. Things were going nicely when suddenly we heard that telltale “PING” as the cutter bounced off the enclosure window. Dang, broke a cutter. What happened? See the tiny wall the red arrow points too? See the tiny wall the red arrow points to? Because of tool deflection, the cutter wasn’t where it was expected and we got that little wall. It shrouded the cutter from coolant reaching it for a very short time before the cutter broke. Problems like this are almost unpredictable, but they can crop up if we’re too aggressive all the time with Tool Deflection. More recently, I had a conversation with another customer about why a cut was working. It seemed like it had an awful lot of deflection. But it turned out something very interesting was happening. This was one of those tough jobs that required a lot of stick out to get down into a hard to reach place. They were running very little Cut Width and as a result, there was Radial Chip Thinning, which meant chip loads were artificially low. 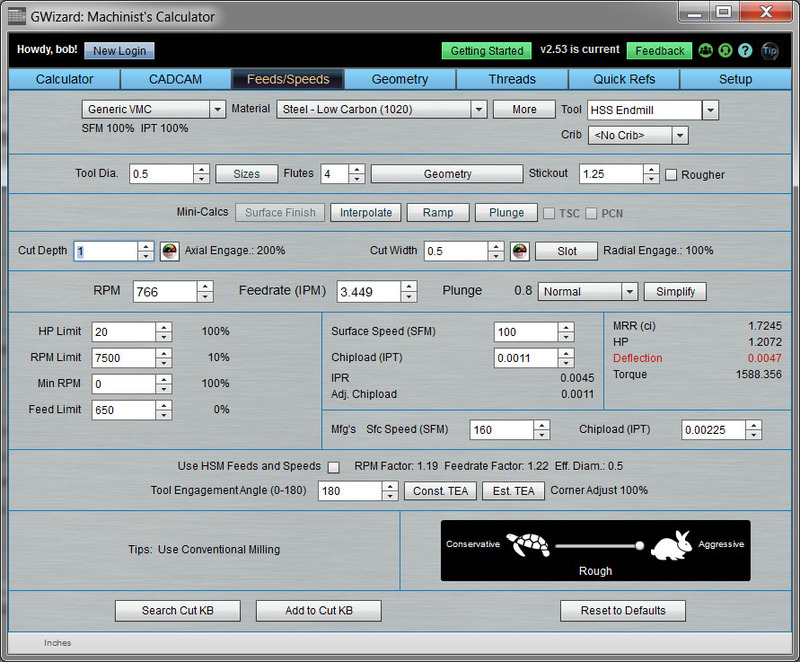 It turned out that the sum of the Tool Deflection and the actual chip load were well within the limits of max chip load for the endmill. In effect, we had a “Chipload Budget” where part was allocated to the actual chip and part was allocated to the Deflection. It was working out just fine for them. This trick is worth keeping in mind for those difficult jobs. Sometimes you may need to trade some excess Deflection for some reduced chip load to get those jobs done without taking too many passes. Doing so enabled this particular job to be done in one full flute length pass. Very clever! 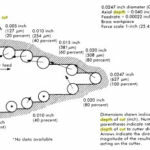 Now that you understand the impact of Tool Deflection on Tool Life, let’s look at its impact on Surface Finish. It should be pretty obvious that tool deflection is bad for finish, but I got a great look at it one day while watching one of John Grimsmo’s knifemaking videos. 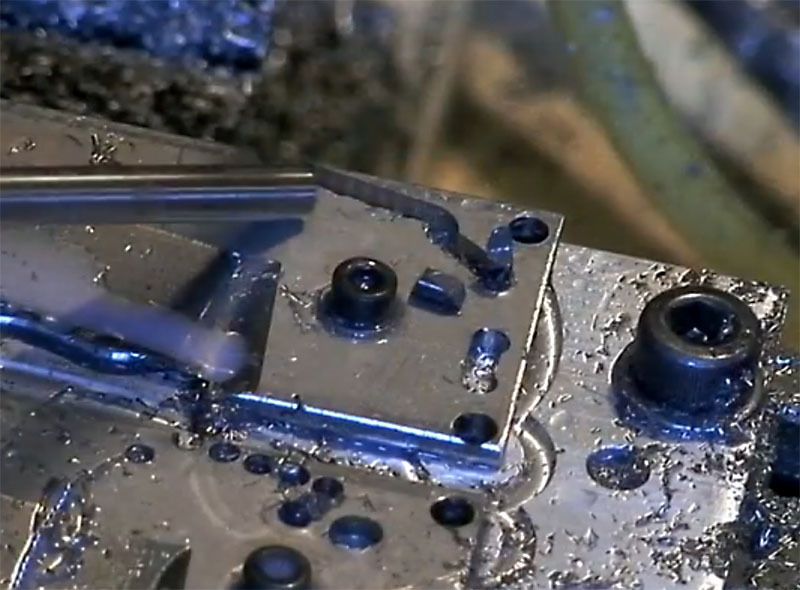 Tool deflection eventually broke the endmill, and John’s video captured it perfectly at about 9:22. This will be the last of the “4 Tool Deflection Evils.” Accuracy has to suffer when the tool tip is flapping around due to vibration. In practice, a little bit of this can be tolerated, although depending on your stepover, you’ll need to beware problems like the coolant wall described above. A little thought tells us we want to have little or no deflection when the time comes to do the finish pass and accuracy counts. Think about what you expect from your measuring tools. First, you can see the Rigidity Calculator is located under “Quick Refs” and “Rigidity”. We’ve chosen a 1/2″ endmill with 1 1/2″ of stickout. The only difference between the two choices is the lower one is made of carbide and the upper is HSS. The Calculator tells us that this change alone is worth a 3X increase in rigidity. That’s a big win and is one more advantage of carbide. Should you then always use carbide? 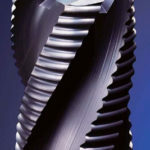 Many do, but here is something that’s not as well known–if you must live with a certain amount of deflection, HSS will withstand more than carbide. HSS is more flexible while carbide is more brittle. This is sometimes helpful to know when all else fails. Increasing diameter from 1/2″ to 3/4″ is worth over 5x the rigidity! This example shows what happens when we increase tool diameter. Going from a 1/2″ to 3/4″ endmill, a 50% increase in diameter, netted over 5X more rigidity. That’s a big win. The goes to the topic of “Design For Manufacturing,” which is all about changing the design to make it cheaper to manufacture. Designers are only human, so they will often specify a corner radius as a nice round number. Say, 1/2″. Of course endmill manufacturers are human too and offer the endmills in standard sizes. What you want is use an endmill just slightly smaller than the corner radius because that’s going to make the nicest cut and be easiest on the endmill, but you want that endmill to be as large as possible while still being smaller than the radius, because the minimizes the deflection, lets us take a beefier cut, and so on. The best way to handle this is for the designer to make the corner radius a little larger than standard endmill sizes. But, there is also a sneaky back door approach. Get out your endmill catalogs. You could try a 7/16″ and see if you like that better than a 1/2″ endmill for a 1/2″ corner, or you could take a look at the metric sizes. You can get either a 12mm or a 12.5mm, both of fall between the 7/16″ and 1/2″ Imperial sizes. Go ahead, sneaky is good in this case! The last variable we’ll play with is stickout. Reducing the stickout from 1.25″ to 0.75″ (back on a 1/2″ endmill again) buys us 4.63x more rigidity. Never use more stickout than you need to. – Rigidity increases as the 4th power of diameter. Little changes in diameter can make HUGE changes in rigidity. Remember that sneaky metric diameter trick for those super deep pockets where you can’t reduce stickout. – Rigidity increases as the 3rd power of length (stickout). You can still make a big difference by reducing stickout a little bit. – Switching from HSS to Carbide gives a flat 3X improvement. All things considered, more flutes can mean more rigid endmills and therefore less deflection. The reason is that with fewer flutes, there is usually a larger solid core diameter. You might consider using a 3 flute instead of a 1 or 2 flute endmill in aluminum to pick up more rigidity. Also, pay close attention to flute length. The openings in each flute mean less core material to resist deflection. So, the longer the flutes (vs solid shaft), the less rigid the tool. So, use cutters whose length of cut is long enough for your deepest pass (but just the portion that’s cutting) and no more. You don’t want flutes sticking up out of the cut because you get no rigidity value from them. BTW, G-Wizard properly accounts for flute length and number of flutes when it calculates deflection–natch! Note that its really hard to predict these directions by calculation, these were actually measured from real cass. The cutter is feeding to the right, so lets see how that compares to the arrows. Note that the examples to the right show progressively deeper cut widths. What we can see is that in conventional milling, with lighter cut widths, deflection makes the cutter “pull back” from the cut a bit. That’s a nice safety feature because it reduces chip load. But, if we bury it, the arrow shifts to force the cutter to not only pull back, but also a bit into the wall. This starts out as a wash, but eventually it results in increased chip loads. By contrast, lighter climb milling forces the cutter to deflect forward into the cut and a bit inward away from the wall. You should switch to conventional milling for the finish pass if you’re at all deflection challenged (use G-Wizard to see if your tool diameter and stickout result in small enough deflection for your finish pass). At the very least, one should avoid too much depth of cut when climb milling lest it invite deflection. 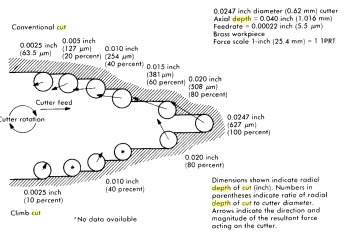 The same article suggests that when deflection is to be minimized, use no more than 30% of the diameter of the cutter for conventional milling and 5% for climb milling. Of course here again, if you have G-Wizard, you’ll know what kind of deflection to expect and whether it’s a worry. 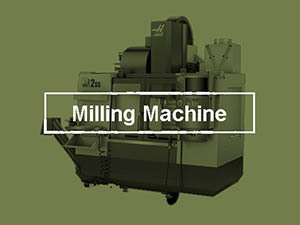 Climbing to rough and conventional to finish is inline with the consensus over at Practical Machinist as well. Properly managing deflection can help you avoid the need for an extra spring cut, which saves time and money. We’re trying to cut a slot 1″ deep with a 1/2″ HSS endmill. Because the slot is so deep, we can’t reduce stickout which is stuck at 1.25″. What do we do? 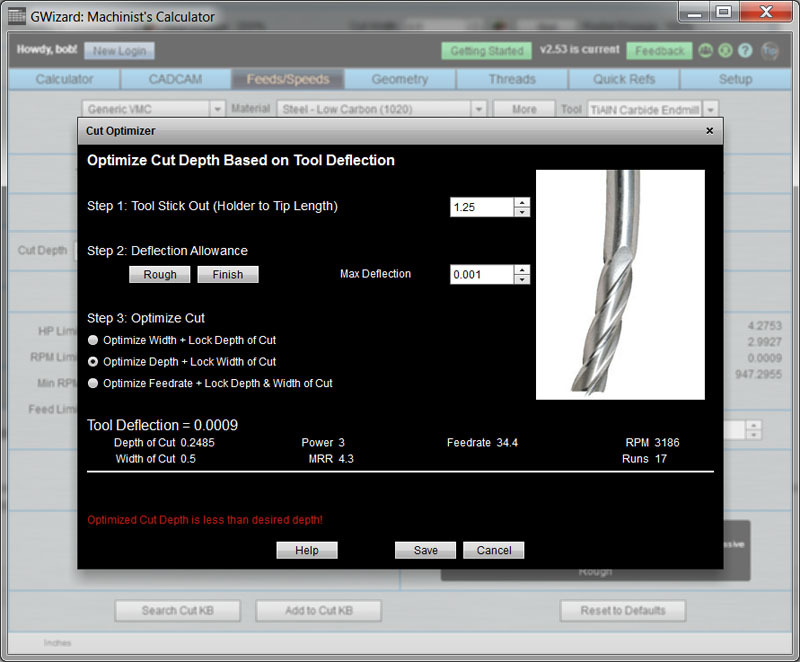 With one mouse click, Cut Optimizer determines the best depth of cut would be 0.2485″, and you can save that back to Feeds and Speeds. Done! GW Calculator also has a feature called CADCAM Wizard that will suggest the optimum tool, stickout, hints for designers (based on that Design for Manufacturing stuff), cut depth, cut width, and feeds and speeds all while controlling tool deflection. There is no more complete solution for Tool Deflection problems available anywhere. 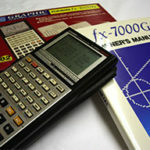 If you haven’t played with G-Wizard Calculator yet, try a free trial. You’ll be surprised at what all it can do for you.